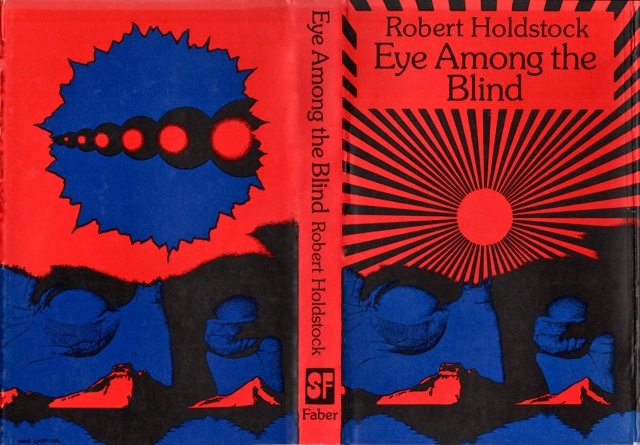 Robert Holdstock’s first science fiction novel, the anthropologically inclined Eye Among the Blind (1976), contains kernels of his later genius. His abilities, according to critics such as John Clute, are fully manifested in works such as his fantasy novel Mythago Wood (1984). 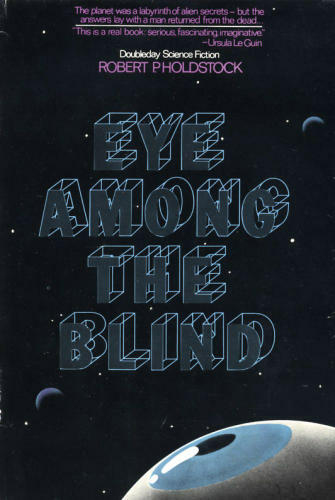 At first glance Eye Among the Blind has the trappings of intellectually inclined “heavy” anthropological SF in the vein of Ursula Le Guin and Michael Bishop. It tackles themes such as colonization, alien collaboration with the colonizers, aliens who do not choose to engage with the colonizers, humans who choose to live among the aliens, humans who study the aliens but are reluctant to appreciate (or take seriously) those whom they study, etc. Although the humans on the planet might claim that they are not colonizing in the traditional sense their sheer presence has ramifications for the world. Ultimately the novel lacks the distilled poignancy of Bishop’s Stolen Faces (1977) or the sheer alienness of the Asadi in Bishop’s novella “Death and Designation in the Time of the Asadi” that forms the first portion of Transfigurations (1979). Also, the ramshackle and uneasy engagement with a spectrum of thematic material means that it never manages to generate the shear complexity and thought-provoking summation of its parts equivalent to the gender theory of Le Guin’s The Left Hand of Darkness (1969) or the genuinely philosophical engagement with religion and science in Bishop’s A Funeral for the Eyes of Fire (1975). Ree’hdworld, although Earth-type, contains a profoundly alien landscape, fauna, and flora. For example, “towering rock megaliths that reared up from the ocean […] each thin and fragile bridges of rock to the main land.” (6). The two main species inhabit the landscape, only partially explored: the sentient Ree’hd, who allowed the Federation to establish a hundred square mile installation on the planet, and the Rundii a “subintelligent second race of Ree-hdworld which had been responsible for a great deal of death among the early human population” (13). Generally the humans, Rundii, and Ree’hd maintain a peaceful relationship, although the upset in the balance propels the novel’s plot. A third race called the Pianhmar, believed to be long extinct, lurk (as myth, as potential fact, as a potential force) in the background. Terming, the human installation is distinctly not a colony open to settlement. A colony implied a “base which man the conquerer would spread his influence” (11). Because the planet is inhabited by a sentient specials, a colony is not permitted. The Ree’hd voluntarily granted one-hundred square miles to InterSystems Biochemicals “who had discovered a considerable among of the local flora to be of interest” (11). Some of the Ree’hd decide to live in Terming, once the place of a large Ree’hd burrow system (now filled with tourist shops), but their entire way-of-living, drive-to-live, and way-of-thinking about the world changes in close proximity to man. In the background of the plot that remains on the planet’s surface another nebulously described force is at play: The Fear. 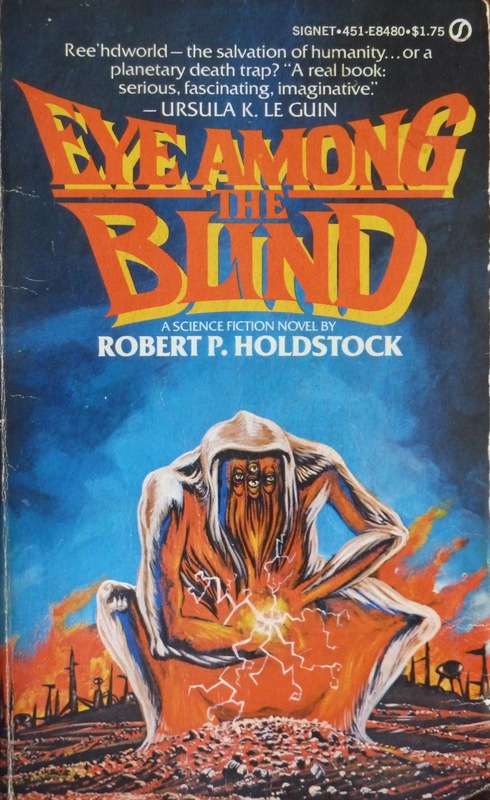 The Fear seems to be a disease that seems to strike more backward and decadent worlds, causing “all will to live” to vanish after “the period of persecution” (9) Holdstock wields the Fear less as a scientific disease and more as a powerful metaphor: the force that will transform humankind from their technologically dependent state. Onto this fantastically realized planet arrive the characters. First, there is Zeitman, a scientist, returning to Ree’hdworld for the second time. He seeks to explain a strange serious of occurrence on the planet: notably increasing violence between humans and the Rundii and changing patterns of interaction between the Ree’hd and the human inhabitants of Terming. Zeitman’s previous scientific research has soured his relationship with the Ree’hd after a horrific incident caused by his ignorance of their customs. There is a more personal element to his visit as well. He seeks to re-unite with Kristina, his estranged partner. Legally still Zeitman’s wife and his one-time colleague in exploration of Ree-hdworld (and the reason he had fled the planet in the past). Kristina has gone native in Zeitman’s absence: she lives with the Ree’hd Urak in his mud burrow. She participates in the rituals that dominate Ree’hd existence including the dawn singing. And in a strange way, she realizes that she deeply loves Urak and Urak loves her although some intangible seems to prevent permanent pairing: “they looked at each other, human and alien, exchanging a gaze that each interpreted in his or her own way, but both interpreted correctly: For Kristina, a look of absolute love; for the Ree’hd, warmth and affection, the alien version of emotions that ought to have led to the cementing of a relationship for life” (23). And then there is Maguire, who claims to be hundreds of years old and one of the first explorers of the world. On the shuttle ride down to the planet’s surface Susanna, Zeitman’s aid, observes him vanish: “He was sitting there one moment, and he looked at me, and I saw him vanish in a split second! Oh, God!” (19). He claims to see despite his blindness and claims to know about the Piahmar, who might still exist. Although not a plot driven work, the final quarter of novel picks up steam and reveals the biological and societal mysteries of the Ree’hd, the Rundii, and the Piahmar and attempts to speculate on the interaction of technology and human development. The world is relentlessly interesting—Holdstock interjects delightful descriptive tidbits continuously through the narrative—and the transformations the Ree’hd, who choose to live with man, undergo is poignant and disturbing. The biggest flaws concern the characters who are distant and less adeptly drawn. The main protagonist is a scientist who cannot let go, to the point of physical violence, his one-time wife, Kristina. His frustration is further exasperated because Kristina lives with the Ree’hd and views herself as a Ree’hd but this plot-line is infrequently expanded on and thus the “going native” is less than convincing. I found the world-engulfing disease, The Fear—that could at any moment send billions of refugees to Ree’hdworld—the most sinister and intriguing element of the novel. Ree’hdworld has remained mysteriously disease-free, and refugees from the Fear would unsettle the biological and sociological balance of the planet and its inhabitants. 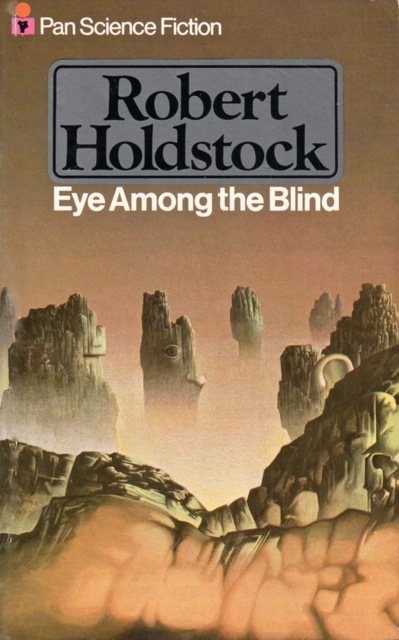 Somewhat recommended for fans of 70s anthropological SF and Holdstock completests. 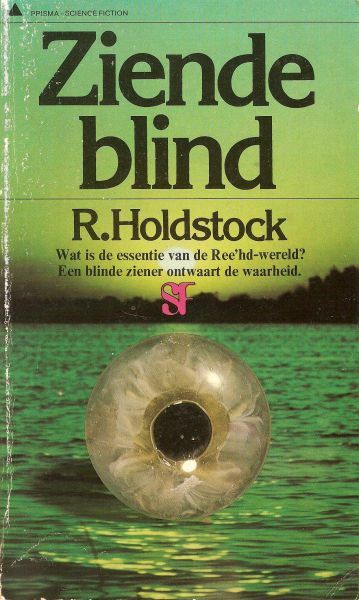 Others will be frustrated with the glacial pace, lack of forward plot movement, and Holdstock’s reluctance to reveal both backstories and clearly indicate the intellectual payoff. Love. Vintage. Sci-Fi! Well done! What do you mean? The art? The book itself was on the disappointing side. Definitely prefer Le Guin or Michael Bishop’s anthropological SF from the same period. Mostly the art. Well…entirely the art. The writing from that period is very much hit or miss. The art inspired me as a child and still does today. The writing from any period is hit or miss. And no, I would argue that the late 60s and 70s produced some of the most spectacular and radical SF the genre has ever seen. I find both the art of the period and the books themselves inspiring — although this one, not so much the book. I haven’t read this one.It doesn’t sound anywhere near as good as “Mythago Wood”.I take it you’ve read that one now then,and thought you might have done a review of it. I should edit that first sentence and suggest that critics think that Mythago Wood is genius 😉 Because no, I have not read it yet. I read this book a good three months ago but have only now gotten around to writing a review. But yes, this was incredibly dense but never seemed to do what he set out to do. Ponderous might be a good word. I enjoyed elements of the work but none of the pieces fitted together as well as they should have. I would say perhaps it would have been better to have read “Mythago Wood”,assuming you could get your hands on a copy,but since I haven’t read this one,I can’t criticise you. I wouldn’t call it 1980s fantasy…..it’s a book of lasting brilliance….still please yourself then. Oh ‘Mythago Wood’ is definitely worth a read… I read several others – including ‘Eye’ – and they were nowhere near as good. No – that one slipped past me. What’s it like – any good? I have no idea, it’s the only other one of his books that I have on the shelf waiting to be read. Sounds like a disappointing read, shame. 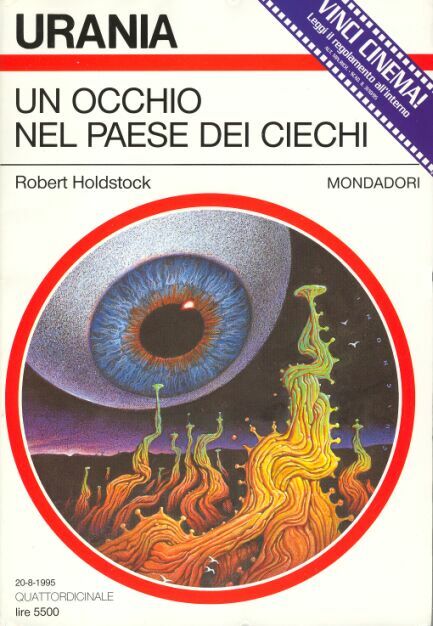 I love the Griffiths cover though and the Italian artwork is just sublime. I rather like the Pan cover, but then I think Pan generally had some great art during that period. Yeah, some elements are intriguing but the whole is very unmemorable/muddled. Where did you get the information that the Pan edition’s cover was done by Peter Goodfellow from please ? At this point I do not remember — a commentator stated that it was via twitter or email or something and I responded and compared the art they provided and thought it was a good guess. Sorry for the vague answer. Peter Goodfollow was a consumate British book cover artist.He was a dominant figure in this form. I hope you read “Mythago Wood” soon.It will “blow you away”,I’m sure.